We have had an incredibly quiet and relaxed Easter holiday. The weather has been pretty dire which meant neither of us fancied our annual Easter Saturday trip to Southend (P to check out the chess tournament and me to check out the charity shops.) If it was this cold in Wickford we both knew it would be an awful lot colder at the seaside so we decided to give it a miss this year. I was hoping to get to the boot sale yesterday morning but there was just too much in the way of drizzle for it to have been worth going to, and today - when there should have been another boot sale - has been cold, wet and windy all day. A total no-no where boot sales are concerned. Still, all this enforced quiet time has given me a wonderful excuse to get on with reading this excellent book. I'd picked up a copy of it in a charity shop months ago but had never got round to starting on it. The trouble with me is I'm terrible for reading murder mystery / thriller type books almost exclusively and rarely venture away from that particular genre. Anyway, when I was visiting Mum in Bristol recently she was reading it and said what a marvellous book it is. She wasn't wrong there - I can barely put it down. I don't think I've been quite so absorbed in a book since I read 'Brideshead Revisited' more than 30 years ago. 'The Help' is brilliantly written and is very easy to read but the story it tells is shocking and thought-provoking all at the same time. Here's the blurb from the back of the book ' Enter a vanished and unjust world: Jackson, Mississippi, 1962. Where black maids raise white children, but aren't trusted not to steal the silver... There's Aibileen, raising her seventeenth white child and nursing the hurt caused by her own son's tragic death; Minny, whose cooking is nearly as sassy as her tongue; and white Miss Skeeter, home from College, who wants to know why her beloved maid has disappeared. Skeeter, Aibileen and Minny. No one would believe they'd be friends; fewer still would tolerate it. But as each woman finds the courage to cross boundaries, they come to depend and rely upon one another. Each is in a search of a truth. And together they have an extraordinary story to tell...' It's a sobering thought for me that this way of life was still going on in my lifetime. 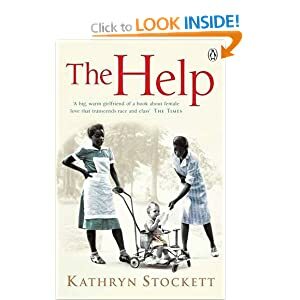 If you come across a copy of 'The Help' I can highly recommend it.